Institute's Aaron Harkin started the ball rolling against Annagh United. This really could have been a cricket score, as Institute missed a host of clear-cut chances. Kevin Deery’s side not only missed chance, after chance, but Michael McCrudden, who scored one, also hit the woodwork three times. The victory moves the Waterside out-fit into joint second spot, two points behind leaders Warrenpoint Town, who they entertain next weekend, at Drumahoe. Institute suffered an injury set-back on 20 minutes as last week’s hat-trick hero Stephen Curry had to be replaced by Ciaron Harkin, after the winger picked up a knee injury. The home side took the lead in super fashion two minutes later thanks to Aaron Harkin’s free-kick. Winger Jamie McIntyre was brought down by Christian Stuart some 20 yards from goal and Harkin’s resultling free-kick, from the right hand side of the pitch, caught out keeper Eoin Hughes and curled into the top corner. Kevin Deery’s men should have doubled their lead just after the half-hour mark after Gareth Brown was brought down inside box, but McCrudden seen the resulting penalty rattle the post. Institute did add a second on 32 minutes when Brown made no mistake firing home from just inside the box. Brown missed what probably will be the best chance of the season, when from close range he some how side footed over the bar, with the goal at his mercy. Six minutes later the woodwork came to the visitor’s rescue again when McCrudden’s close range header came back off the post, before Jonathan Campbell cleared off the line. McCrudden did manage to score on 41 minutes in sublime style, as he skipped around a few challenges right along the touch-line and fired high past Hughes from a tight angle. In the closing minutes of the half, Hughes had to keep out Brown’s close range header and Stephen O’Donnell fired well wide when placed inside the box. Right at the start of the second half, Institute should have added a fourth but Ciaron Harkin saw his effort hit the side netting, after he rounded keeper Hughes. Institute did get a fourth on 59 minutes after Darryl McDermott’s ball over the top found McIntyre and calmly fired home with his weaker left foot, past a hapless Hughes. 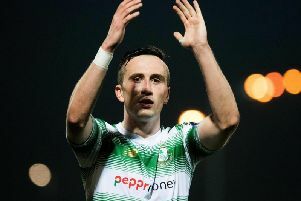 Substitute Ciaron Harkin missed another glorious chance on 73 minutes when he somehow headed over from a few yards out. Incredibly McCrudden hit the woodwork for a third time on 76 minutes when Ciaron Harkin’s right wing centre found the midfielder, but his powerful header was superbly tipped onto the post by Hughes. The visitor’s miserable day got worse on 83 minutes as they were reduced to ten men when Andy Smith was cautioned for a second time before deservedly being shown a red card by referee Garvin Taggart. From the resulting free-kick Stute completed their rout, substitute Sean Roddy nodded the ball down for McIntyre, who made no mistake planting the ball low into Hughes’ bottom right corner. Institute: Gallagher, O’Donnell (Roddy 65), McDermott, Scoltock, Morrow (D Curry 65); S Curry (Harkin 20), A Harkin, Doherty, McIntyre; McCrudden, Brown. Annagh United: Hughes, Smith, Stuart, Campbell (White H-T), Stewart, Webb, Taylor (Judge 65), Whitten (Smith 65), Parks, McClurg, McElroy.